Researchers at the UMB School of Economics and Business have contributed heavily to a new book on data collection and research methods in developing countries. 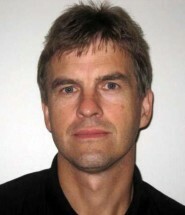 Professor Arild Angelsen has been the lead editor of the book, “Measuring Livelihoods and Environmental Dependence. Methods for Research and Fieldwork”, and has together with Professor II Jerry Shively and researcher Ronnie Babigumira contributed to 8 of the 14 book chapters. -The book is unique in the way that no other offerings in the market review the complete process of quantitative data collection in such a systematic manner. It fits well into a solid tradition in development and environmental economics in the department, which seeks to combine basic theory and methods with insights into the practical challenges when theories are put into practice, says Angelsen. Thousands of surveys on rural livelihoods in developing countries are being done every year. Unfortunately, many suffer from weaknesses in methods and problems in implementation. Quantifying households' dependence on multiple environmental resources (forests, bush, grasslands and rivers) is particularly difficult and often simply ignored in the surveys. The results therefore do not reflect rural realities. The book covers the entire research process from vague research ideas to writing a research proposal, sampling, questionnaire design, valuation, interview techniques, data entry and “cleaning”, and analysis. Angelsen says the book draws on the experiences from a large global-comparative project, the Poverty Environment Network (PEN), which is a network of PhD students with data from 8 000 households in 24 countries. Angelsen is coordinator of the project, while Babigumira has been responsible for the global database. -Additionally, several years of experience with dozens of Master and PhD theses in the department have been invaluable. Arild Angelsen, Helle Overgaard Larsen, Jens Friis Lund, Carsten Smith-Hall and Sven Wunder (eds). 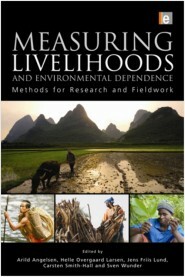 Measuring Livelihoods and Environmental Dependence. Methods for Research and Fieldwork. Earthscan, London 2011.